"The Floating World" -- 10x10 inch acrylic and cut paper on cradelled wood panel. (original is SOLD) Prints are available here on ETSY. 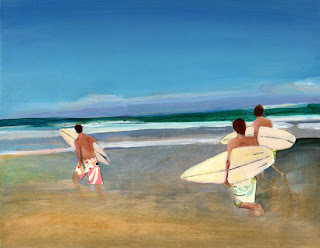 This is #6 in my surf series, and it was inspired by the children of the film "Surfwise." 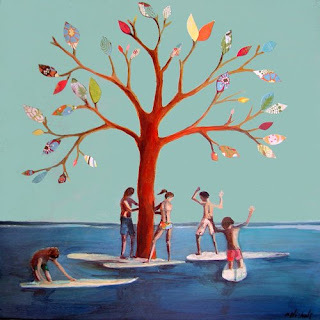 The alternate title I toyed with for it was "Balance," because so much about this painting reflects that concept: the children and the tree itself, but also the actual composition of the painting and the placement of each shadow in the water, leaf on the tree and piece of cut paper for each child's swimsuit. But I ultimately settled on "The Floating World" because it was more magical -- just like a tree floating in the middle of the water and the idea of spending your childhood in an RV chasing waves. "The Boys of Summer" 8x10 inch mixed media acrylic & paper on birch panel. Original is sold, but prints are available here. The latest in my surf series! And don't we all love the boys of summer? Sigh. 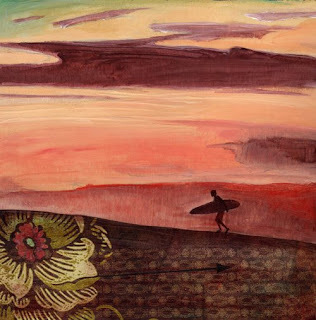 After reading through Christophe's comments on "Heading In," I decided that he was BRILLIANT because I like the title "Indian Summer" so much for my surfing painting. Thank you, Christophe! Now don't we wish we were having an indian summer right now in NY rather than its opposite - a June full of rain and cold temperatures. What is this called? Eskimo Summer? "Heading In" Acrylic and Mixed Media on Wood. 8x8 inches. Original is sold, but prints are available on ETSY. Happy Anniversary Kara-Leigh & John! 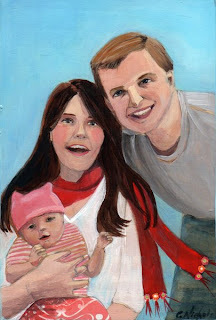 "Kara-Leigh, John and Penny-June" Tiny Portrait on wood panel 5x7 inches. Wishing this lovely couple a happy, happy "wood" anniversary today! They are my latest tiny portrait and just so cute. And, for my kind readers who have steadfastly revisited the blog despite my long absence, THANK YOU! I have been a tad overwhelmed at the moment, but things are getting better. I'm now working on a series of surfing paintings on wood. These are such fun, and I will post them as they unfold. Have a great day.